While the lot for the Cincinnati location of Cooper’s Hawk Winery & Restaurant was full to capacity, we were astonished at how spacious the location was. After confirming our reservation, we were brought back to the main dining room. Lower lights made for a cozy experience. 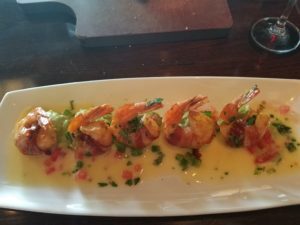 The Mexican Drunken Shrimp ($13.99) were huge and imbued the natural crispness of the shrimp with crispy, salty bacon, a bit of a citrus twist from the tequila lime butter sauce, and ramped up the creaminess with a goodly dollop of guacamole. Our dark horse for best plate of the night was the Crispy Brussels Sprouts ($8.99). 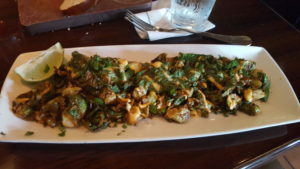 The wife and I were pleasantly surprised at this appetizer as Cooper’s Hawk’s cooks made the brussels sprouts as robust as a fresh potato chip. The crispness of the veggie was matched well with a sweet thai chili and aioli that linked sesame and sriracha. Cashews furthered the crunch of the plate. 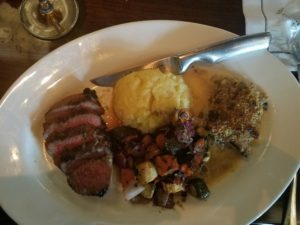 The surf and turf option offered by Cooper’s Hawk allowed me to try the sliced ginger soy glazed New York strip ($30.99) along with the pistachio-crusted group. 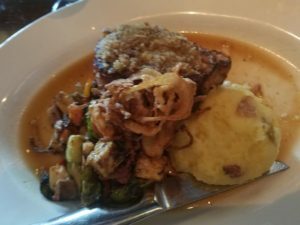 Another highlight of the meal was their pork chop ($24.99), which came tossed in a maple / mustard / pretzel crust. The steak and pork chop were succulent and prepared to our instructions. As one can imagine, a major focus of Cooper’s Hawk are the wines that they offer. Each of the entrees and plates on the restaurant side of things has a number by the item, representing a proper pairing that accentuates both the wine and the plate. Cooper’s Hawk’s Petite Sirah ($7.75 / glass, $26.99 / bottle) is a delicate take on the jammy, peppery style. The range of wines that Cooper’s Hawk offers is substantial, whether it be sparkling varietals – the prosecco, Blanc de Blanc, a sweet sparkling red or whites – a Chardonnay (an unoaked and an upper tier “Lux” version), riesling, viognier, and more, one will have their particular itch scratched. 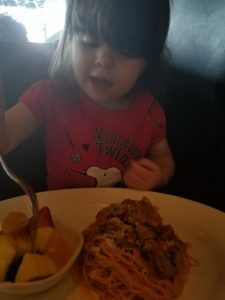 The wife likes reds, which Cooper’s Hawk has by the boatful – a merlot, malbec, cabernet zinfandel, and a house blend merely scratch the surface. 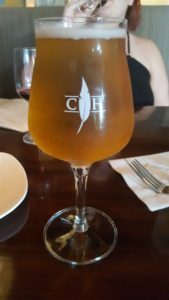 Alongside the wine, we tried out their house ale ($7.50) which had been specially brewed by Goose Island for the chain. In this effort, hints of hay and grain with just a bit of earthiness dominate. The ale paired nicely with the decadent steak. 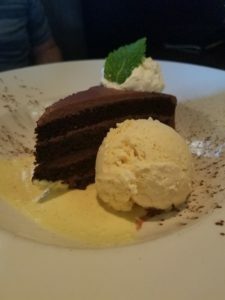 The Cooper’s Hawk Chocolate Cake ($7.99) was decadent, a solid conclusion to the meal. The portion of cake that we received was able to stretch to all three in our party. 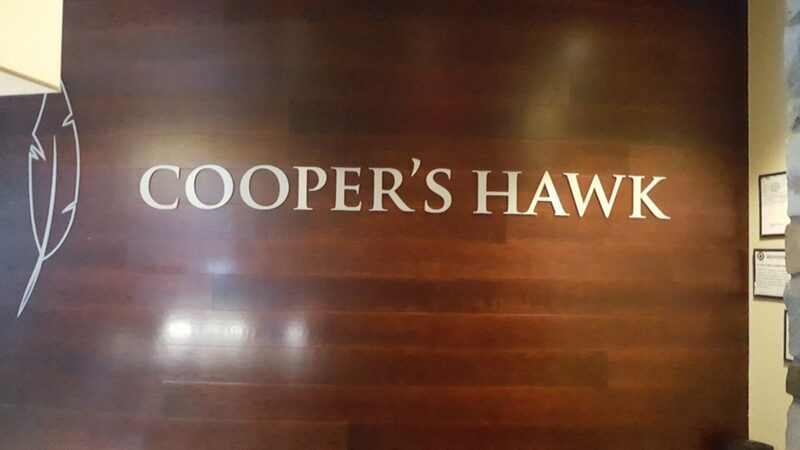 The Cincinnati location of Cooper’s Hawk Winery & Restaurant is open from 11 until 9:30 PM on Mondays through Thursdays, 11 to 9 on Sundays, and 11 am until 10:30 PM on Fridays and Saturdays. Their bar is open an hour later on each day. Individuals can make a reservation for the restaurant through OpenTable and through traditional (phone/e-mail) methods. The restaurant is ornately furnished, the staff each possesses a depth of knowledge that is rare in dining, and one’s overall visit to the restaurant will be memorable. For additional information about the full menu, wines, and other information about the company, check out their domain.